The Beatles, of course, and Mersey Beat musicians of the 1960s like Gerry and the Pacemakers. More recently, Elvic Costello, Frankie Goes to Hollywood and Atomic Kitten have all been 'Scousers (Liverpudlians). On a more sober note, Liverpool's early fortunes were made in the slave trade, making it a moving and important place to visit for anyone interested in this aspect of history. Liverpool is located on north side of the River Mersey in England's Northwest, about 216 miles from London. It is about three miles up river from Liverpool Bay, part of the Irish Sea, and is further sheltered from oceanic weather by the penninsula known as The Wirral. Liverpool's sheltered position makes its climate somewhat milder than other northern English cities. Summers are moderately warm - rarely hot- and winters cold and wet. The average winter temperature is 42°F though it can fall below freezing. It sometimes snows in January and February. John Lennon Airport 8 miles from the city center, for Irish and European destinations. Manchester Airport, linked by rail to Liverpool, is one of England's major international gateways. Local trains and buses as well as ferry information is available from Mersey Travel. Taxis and minicabs - ComCab Liverpool, formerly known as Mersey Cabs, is Liverpools largest taxi company. Their black cabs look like London taxis and can be hailed in the street. Ferries The famous "Ferry Cross the Mersey" is part of Liverpool public transportation services. Both commuter services and cruises are available. Groove at The Casbah and The Cavern Club where it all began. Take a Ferry Cross the Mersey. In 2015, in honor of World War I commemorations, one of the ferries, The Snowdrop, was turned into a "dazzle ferry" by pop artist Peter Blake, who also designed the cover of the Sgt Pepper album. The "dazzle" design honors the patterns that were used on ships during the war to baffle the eye and make it difficult for enemy gunners to target them.Every ship and had a different design so that they could not be identified by type, class or size. In October 2016, the Dazzle Ferry was out of service for repairs but was scheduled to be back in service by December 2016. 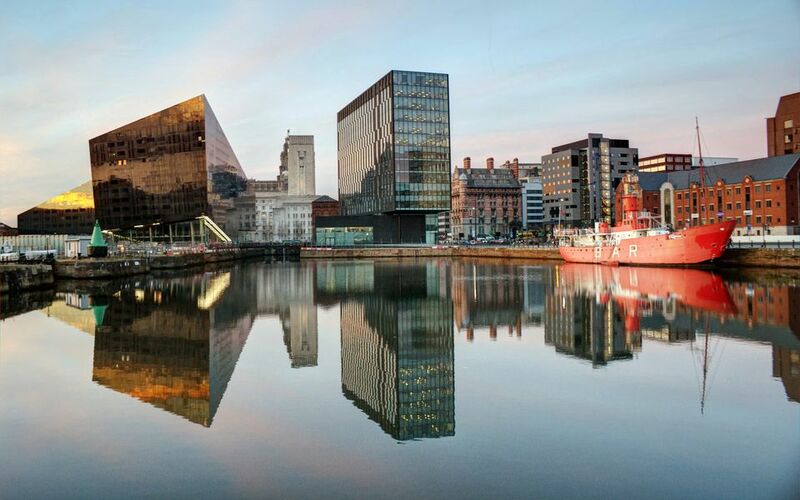 Explore Liverpool's maritime history in its UNESCO World Heritage Site Dock Front and its fabulous Merseyside Maritime Museum. Remember the Abolition of Slavery in the British Empire by visiting the International Slavery Museum, the world's first, or learn more by following the Slavery History Trail. Visit The Tate Liverpool, the North's hippest art gallery. Step back in time at Speke Hall, the most famous Tudor mansion in England - and right outside the city center. Best Bistro - 60 Hope Street, 60 Hope Street, Liverpool L1, 9BZ. Telephone: +44 (0)151 707 6060. Best Cocktails - Berry and Rye, at 48 Berry Street, a Prohibition-themed bar so hip it doesn't even have a website. Or Santa Chupitos, off the beaten path in the Ropewalk area, where among the drinks you can have a $5 Shake, a Dirty Mexican or a Jimmy McNullty. This bar is described as "not for the faint hearted" when it comes to knocking them back.